Four years ago the U.S. Congress established American Craft Beer Week (ACBW) with the passage of House Resolution 753. "The Mother of All Beer Weeks" takes place this year from May 17-23 and is a celebration of all the 1400+ small and independent craft brewers in the nation. Three years ago I visited one of my favorite craft breweries, Russian River Brewing Company during a family wine vacation. Having brewed clone versions of a few of their beers in the past, this was a bucket list type of visit. Owner and brewmaster Vinnie Cilurzo exemplifies craft brewing. Despite now brewing world class beers as a professional, Vinnie embraces the homebrewing community that he once was a part of and readily shares scaled down versions of his recipes. He also responded back to me personally by email before our visit and ensured my family and I received a private tour of their Santa Rosa facility. Two years ago The Ferm only existed in the minds of our humble motley crew of beverage enthusiasts. Now we are like the greatest source for adult beverage talk on the entire Interwebs… in our minds. One year ago Two Pints and I celebrated American Craft Beer Week on this blog by opening up a bottle of beer we had been saving for some undetermined occasion. We shared our thoughts in a celebratory rather than pedantic fashion with a little He said/She said. Please join us in celebrating by supporting American Craft Beer Week by enjoying a craft beer or attending some of the special events being held in your city. You can also show your support by "liking" ACBW on Facebook and signing the Declaration of Beer Independence. Cheers! Ask for a "blind pig" in a saloon during prohibition and you might just get a beer… During prohibition, using the term "blind pig" discretely meant many different things. Sometimes it was the secret code given to a bartender to receive a beer. In other places, it meant that you paid a small fee to see a "blind pig," and along with the viewing you'd get a beer, or something else... And what type of glassware would your "blind pig" be served in? An unmarked mason jar of course. In those days, a mason jar was known as a pig, and an unmarked mason jar was known as a Blind Pig. Use the term discretely today and you'll get Russian River's Blind Pig IPA, a bold IPA packed full of hop aroma, flavor, and bitterness. 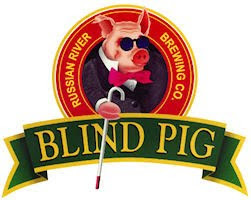 Please keep Blind Pig IPA refrigerated and consume fresh to experience the immense hop character. Unlike many of our other beers, Blind Pig IPA is not meant to be aged. Blind Pig is a perfect way to kick off ACBW '10. When we visited Russian River three years back, this beer was not available by bottle. Since, the brewery has acquired an additional brewing facility that they utilized to increase their production and to begin bottling Pliny the Elder and Blind Pig. We acquired this bottle as a gift from my parents during one of their California wine excursions last year. For those of you that haven't experienced Blind Pig IPA, the aroma and flavor is pure hop heaven. The nose almost exactly matches the taste, with citrus and pine flavors dominating, but not destroying your palate. Like any good story, this beer has a beginning, middle, and an end... but they are hops, hops, and hops. Not so surprisingly for those familiar with Vinnie's work, Blind Pig is incredibly drinkable and a beer even my wine drinking mother loves. Oh the aroma! It is like I've died and been buried in the freshest and most pleasant hop bed any craft beer drinker could imagine. The carbonation is light to medium. The taste is crisp, and not sweet. Blind Pig is down and dirty hoppy! Delicious – I give it a 4½ hops out of 5. So it's an IPA, but not supposed to be aged? Contradictory? There could be some other stabilization factors, but it is my understanding that this beer tastes best when it is fresh because its hop profile is at peak after bottling. Hops kind of mellow over time. Correct SirRon, hop fragrance and flavor has a very quick half life in finished beer.